Heat gas or charcoal grill. Remove pie crust from pouch; unroll on work surface or cutting board. With pizza cutter, cut crust into 4 equal pieces. In medium bowl, beat cream cheese, sugar, lemon peel and vanilla with electric mixer on medium speed until fluffy, scraping bowl occasionally. Divide cream cheese mixture evenly among crust pieces; top each with 1 tablespoon jam. Brush water over edge of crust. Fold crust over filling; press edges firmly with fork to seal. Place turnovers on grill over medium heat. Cover grill; cook 5 to 7 minutes or until bottoms are hardened and slightly browned. Gently turn with spatula; cook 4 to 5 minutes longer or until golden brown and fully cooked. Cool slightly before serving. Holes in the dough will cause the filling to seep out; take care to avoid this. If you do get a hole, moisten the dough and press together to reseal. And be sure to seal the edges tightly so the filling doesn’t leak out while cooking. 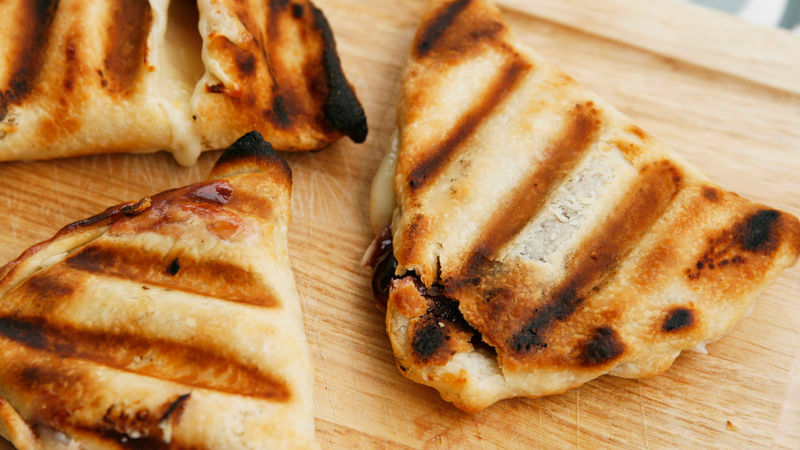 Try another flavor of jam in these turnovers.